The Virginia Railway Express (VRE) (reporting mark VREX) is a commuter rail service that connects the Northern Virginia suburbs to Union Station in Washington, D.C., via two lines during peak hours: the Fredericksburg Line from Fredericksburg, Virginia, and the Manassas Line from Broad Run station in Bristow, Virginia. Discussions about commuter rail service in Northern Virginia had occurred as early as 1964 at the Northern Virginia Transportation Commission, but died in the face of opposition by the freight railroads whose tracks offered ready access to core employment areas. The Metropolitan Washington Council of Governments eventually commissioned a regional feasibility study by R.L. Banks and Associates, Inc., and planning began in earnest for VRE in 1984. In the meantime, Washington Metro extended its service to much of the inner ring of Northern Virginia, including the independent cities of Alexandria, Fairfax and Falls Church and Arlington and Fairfax counties, which are members of the NVTC. By 1986, it became apparent that the jurisdictions outside of NVTC could not reach agreement on how to support VRE by joining NVTC so the Potomac and Rappahannock Transportation Commission was created for Prince William and Stafford counties and the city of Manassas. Legislation established a 2% motor fuels tax to support VRE expenses and other transportation investments. By 1988, NVTC and PRTC established a VRE Operations Board, consisting of three voting members plus alternates from each of the two commissions, plus a voting representative of the Commonwealth of Virginia (currently a representative of the Director of the Virginia Department of Rail and Public Transportation). The following year, the jurisdictions participating in the VRE project agreed to fund it according to a formula that weighted ridership by jurisdiction of residence with a factor of 90% and population with a factor of 10%. Arlington and Alexandria agreed to contribute to the project and have paid each year approximately what their formula share would be. The cities of Fredericksburg and Manassas Park joined PRTC in 1990 and signed the VRE Master Agreement and became participating jurisdictions in 1992. Spotsylvania County joined in February 2010 to allow construction of Spotsylvania station, which opened in November 2015. Rail service operates Monday through Friday during peak hours only, with trains traveling toward Washington in the morning and toward either Manassas or Fredericksburg in the afternoon. Service is suspended or reduced on some holidays. Through a cross-honoring agreement, VRE and the MARC Train allow passengers to transfer to trains on the other system that are going in the opposite direction of the rush-hour commuters. VRE operates on lines owned and maintained by Amtrak, Norfolk Southern and CSX Transportation. Most of the Fredericksburg Line is on CSX tracks, while the portion of the Manassas Line west of Alexandria is mostly on Norfolk Southern tracks. Union Station in Washington, D.C., which is the northern terminus for most VRE trains, is owned and operated by Amtrak, including the station tracks. VRE's trains were initially run by Amtrak. On November 5, 2009, VRE awarded a five-year, $85 million operating and maintenance contract to Keolis, a subsidiary of France's national railway. The change in operations took place on July 12, 2010, two weeks later than planned, to allow Keolis employees to learn how to run VRE trains. Ridership on VRE increased an average of 13% each year from 2000 to 2005, but fell 2% in the fiscal year ending June 30, 2005. VRE said passengers affected by track maintenance and heat restrictions were taking other forms of transportation. The trend reversed in the summer of 2007, with ridership up nearly 2% in June and 4% in July compared with the corresponding months in 2006. As of October 2016, VRE transports an average of 19,400 passengers per day. In 2015, VRE extended its contract with Keolis for five years, with an additional option for another five-year extension in 2020. VRE's fares are based on distance, with the 19 stations grouped into zones. The two lines intersect at Alexandria Union Station in Alexandria. The Fredericksburg Line runs north–south along trackage owned by CSX, formerly the Richmond, Fredericksburg & Potomac Railroad. Amtrak service to Richmond, Virginia, and points south also uses this line. An extension to Spotsylvania opened in November 2015. The Manassas Line runs east–west along trackage owned by Norfolk Southern. Three Amtrak trains, the Crescent, Cardinal, and Northeast Regional, also use this line. VRE studied an extension of the Manassas Line west to the communities of Gainesville and Haymarket, but chose instead to pursue added service on the existing line to Broad Run. VRE operates one seasonal station in Clifton, Virginia. The location is only open for special season events in the town. Starting in 2015, VRE began a study of extending service to Haymarket via a short branch line from the Manassas Line, but found that ridership would not sufficiently increase to justify the estimated $660 million cost and ended further consideration of the line. 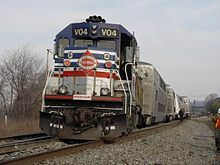 The Virginia Railway Express commenced operations in 1992 with ten EMD RP39-2C diesel locomotives, 38 Mafersa coaches, and 21 remanufactured Budd Rail Diesel Car (RDCs) from the MBTA. Morrison-Knudsen rebuilt the locomotives from EMD GP40s at a total cost of $5.9 million. Mafersa built the coaches new at $24.7 million, or $600,000–$700,000 per car. VRE sold 33 of the Mafersa coaches to the Connecticut Department of Transportation in 2004 for its Shore Line East service. QIT-Fer et Titane, a Quebec mining company, purchased the remaining five cars in 2008. V1–V10 retired EMD RP39-2C Rebuilt from original units by Morrison-Knudsen. Lack the flared radiators of VRE's GP40s. V24 acquired from North Carolina Department of Transportation. V30–V31, V34–V36 retired EMD F40PH-2 All former Amtrak units (originally ex-GO Transit). V30 returned Amtrak's Beech Grove Shops as AMTK 403. V31 was leased. V32 and V33 have also been sold and removed from the roster. V50–V69 active MPI MP36PH-3C Total order of 20. The first unit was delivered on August 5, 2010, and all units are currently in service. These are the first new locomotives that VRE purchased. VRE also operated a pair of EMD F59PHI locomotives and 18 high capacity bi-level cars leased from Sound Transit between 2003 and 2006; they have been returned and replaced by locomotives V50–V69 and the Sumitomo bi-level cars. † Eight cars ordered in February 2012 with options for 42 more. VRE derailment on January 5, 2006. On January 5, 2006, at 6:45 am, Fredericksburg line train No. 304 bound for Washington, D.C. derailed at Possum Point, just north of Quantico. Four people, including the assistant conductor, suffered minor injuries. The National Transportation Safety Board determined that the derailment was intimately related to CSX's maintenance practices: a switch point had been repeatedly identified as deteriorating, but CSX failed to replace it. Eventually, the excessively worn and chipped point caused the lead truck of a passenger car to derail—the fourth car on train 304. On October 3, 2012, Virginia Governor Bob McDonnell launched a review of "multiple internal control issues", including reports of corruption and favoritism, that "call into question the management of the Virginia Railway Express". For example, VRE managers disregarded warnings by a former employee, later borne out, that a train would hit the new Broad Run platform. ^ "Transit Ridership Report Fourth Quarter 2017" (pdf). American Public Transportation Association. March 13, 2018. Retrieved July 9, 2016 – via http://www.apta.com/resources/statistics/Pages/ridershipreport.aspx. ^ a b c Taube, Richard K. (August 11, 2008). "Chronology of the Virginia Railway Express: 1964 to Present" (PDF). Virginia Railway Express. Archived (PDF) from the original on November 17, 2015. Retrieved November 16, 2015. ^ HDR Engineering (August 4, 2010). "Spotsylvania County VRE Commuter Rail Station Site Screening Analysis: Final Technical Memorandum" (PDF). Spotsylvania County. Archived from the original (PDF) on August 5, 2014. Retrieved January 17, 2013. ^ Lazo, Luz (October 26, 2015). "VRE's Spotsylvania station to open next month". Washington Post. Archived from the original on October 27, 2015. Retrieved October 27, 2015. ^ "VRE Schedules". VRE. Retrieved November 28, 2018. ^ "Amtrak & MARC Cross Honor Agreements". VRE. Retrieved November 28, 2018. ^ "Keolis in, Amtrak out at VRE". Trains Magazine. November 6, 2009. Retrieved June 10, 2010. ^ Buske, Jennifer (July 10, 2010). "Amtrak ends role as VRE operator; Keolis to start Monday". The Washington Post. ISSN 0190-8286. Archived from the original on August 1, 2015. Retrieved September 27, 2015. ^ "Amtrak gets two more weeks to operate Virginia Railway Express". Trains Magazine. June 10, 2010. Retrieved June 10, 2010. ^ "CEO Report: December 2016". December 2016. Archived from the original on February 2, 2017. ^ Worrell, Carolina (July 14, 2015). "VRE extends contract with Keolis". Railway Age. Archived from the original on September 17, 2015. Retrieved September 27, 2015. ^ Lazo, Luz (November 15, 2015). "VRE Spotsylvania station to open Monday". Washington Post. Archived from the original on November 15, 2015. Retrieved November 16, 2015. ^ a b "VRE throttles back Gainesville, Haymarket expansion plans". Trains Magazine. March 21, 2017. Archived from the original on March 21, 2017. Retrieved March 21, 2017. ^ Middleton, William D. (1994). North American commuter rail 1994. Pasadena, CA: Pentrex. p. 16. OCLC 32665882. ^ "Connecticut State Rail Plan 2012-2016" (PDF). Connecticut Department of Transportation. 2012. pp. 37, 238. Archived (PDF) from the original on April 1, 2016. Retrieved March 26, 2016. ^ a b c d e f g h i "Virginia Railway Express". The Diesel Shop. October 29, 2015. Retrieved November 28, 2018. ^ a b c d e "Equipment & Train Consist". Virginia Railway Express. November 21, 2017. Retrieved November 28, 2018. ^ "VRE taps MotivePower for 12 locomotives, option for 8". August 18, 2009. Archived from the original on August 22, 2009. Retrieved July 8, 2010. ^ "VRE has $5.1 million surplus". Washington Post. September 20, 2010. Archived from the original on September 19, 2010. Retrieved September 20, 2010. ^ Buske, Jennifer (August 5, 2010). "Virginia Railway Express begins adding new locomotives to its fleet". The Washington Post. Archived from the original on November 11, 2012. Retrieved August 5, 2010. ^ a b c "Request for Information (RFI) RFI No. 013-011 Sale of Gallery Style Passenger Cars". VRE. March 1, 2013. Retrieved November 28, 2018. ^ "Virginia Railway Express orders gallery cars". Railway Gazette International. February 17, 2012. Archived from the original on February 18, 2012. Retrieved February 18, 2012. ^ "Gov. McDonnell Initiates Review of VRE". patch.com. November 14, 2012. Wikimedia Commons has media related to Virginia Railway Express.